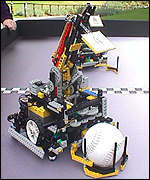 Kevin Warwick, leading the University of Reading's team said: "The robots are autonomous - a key aim in robotics. Once the game starts they are on their own." And they certainly were. 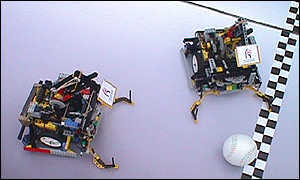 Numerous technical time-outs were called and one robot limped off the field. In the end, only the Cardiff's team speed came close to matching Trinity's but the latter emerged winners, pocketing a surprise £1,000 prize.